Another New Zealand school year is about to start, so I guess that means I need to unpack my brain and get started on this year’s education readings. Can Lego Help Return Play to Children’s Lives and Education? Peter Gray commenting on a Lego Foundation conference – a good read. An article from England, however from what I read online this is a widespread concern. Thanks to Ivon Prefontaine for the link to this. Ivon’s Leadership, Innovation, and Creativity Scoop.it site is well worth following. ‘“You’ve been teaching long enough to be pretty sure that hand is going to go up as soon as you got started on this topic, and so it does, with an annoying indolence. All right. You gesture toward the hand, Let’s hear it. Bruce wrote this article for New Zealand teachers who are about to enter the fray for the new school year; however it has relevance all over. Bruce’s comment: Are principals really’ instructional leaders’ or’ lead teachers’? Do you go to your principal for help or to an admired fellow teacher? The reality of the principal’s role is to create conditions to encourage creativity and to trust teachers. Bruce’s comment: The state of testing – is USA the model to follow? 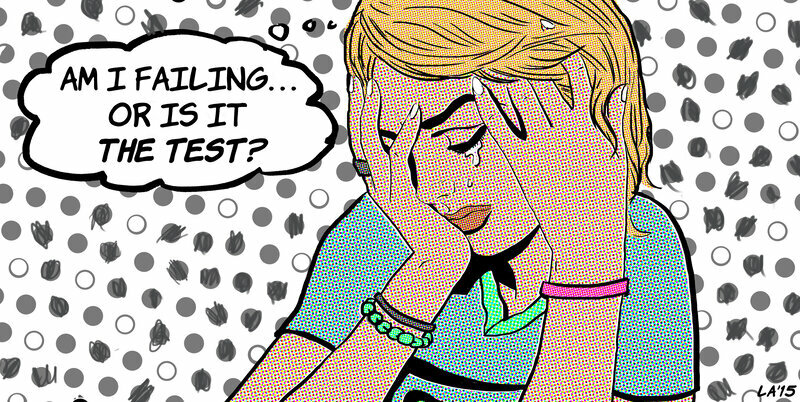 This testing obsession must never take over New Zealand schools! Bruce’s comment: This TED talk by the author of The Second Machine Age is a must to watch about the future of jobs in the coming decades. It is a positive message. Schools need to be about encouraging exploration, imagination and creativity – not the current push towards standardisation ( which has more to do with the first Industrial Age. Be great to show to staff and senior students. Andrew Mcafee gives a powerful quote about education ‘I learnt in Montessori school that the world was interesting and it was my job to explore it. Then I went to public school – it was like being in the Gulag’. Bruce’s comment: The real truth – myths about education. How many apply in NZ? (or in your location, wherever that may be). Treehorn: What’s wrong with a pupil-centred, achievement-focussed, test-free, holistic schooling system ? Why can’t we kids have it? Aussie Kleinist Testucator: What’s wrong with a fear-based, tension-building, teacher-squirming, scoring-based system ? We’ve got it. We like it. You lump it. The highest award of the Strayan Day handouts went to TREEHORN for gross educo-political naivety. His Tonyness, devoted squire for Australia’s Emperor [who art in New York and next in line for a hood], Australia’s loftiest of Autocrats, sometimes called ‘Captain’, granted the Golden Hood to Treehorn using his oft quoted observation that “We can’t stop people being homeless – I mean ‘stupid’ – if that is their choice.” That’s Treehorn. His Tonyness said : To be known as Sir Green and Shrinking, Treehorn and his companions deserve this award. They have to realise that holistic, achievement-focussed, pupil-oriented learning is ‘dead, buried and cremated.’ This is the era of old-fashioned British Grammar School kinds of instruction with exceptionally heavy emphasis on success at knowing only what can be rigorously tested on paper or machine, arranged by psycho-metrics. No wink-wink about it. Dills. In added comment, his loyal kleinists, busily preparing the gas chambers for this year’s intake, reminded Treehorn and other anti-naplanners and distressed test-queer school kids, that they have as much chance of attracting sympathy from the Pavlov-conditioned bystanders, as the Jews had of having Auschwitz disapproved by sympathetic bystanders. Who cares? His Tonyness: Christmirror Plasticpine, for the introduction of endless ‘whatevers’ to Australian schooling. You shall be known forthwith as Sir Stufferupper, keeper of reliteratized versions of a schooling Napalm and the dogged maintenance of hysterical versions of the curriculum. Sir Stuff: I do my best, Your Blessed Tonyness. His Tonyness: Rampant Muchaquid, for making tons of money from the plight of Treehorns, those funny little creatures that keep getting under our boots…and need your kind of stamping upon. I shall dub you, Sir Amplify Big Apple, in accordance with your wishes. You represent the best of RLoyal American Australians. Sir Rampant: Thanks Tony. You are a good obedient lad. Half the lies they tell about your supervision of my empire , aren’t true. You’ve done good. Not sure about you-know-who. His Tonyness : Mr. Squeeky Kleen , other foreigners [although; NY is home really – like – our capital] like Sir Fill and Sir Rampant – we don’t care much where our hoods come from – your Wallest blue blood makes you an admirable standard bearer for those without standards. You shall be Sir Testalot of Brooklyn [as announced on Straya Day] in recognition of your control from far, far away, of your sweet-talk control of the big end of Australia and of your ability to buck up its system. Sir Testalot: Any time, Jewel—oops— Tony. His Tonyness: Ms. Con. Hardard, for ability to corral and sweet talk any person or group of persons at any time for any purpose, nefarious or otherwise. It’s a unique skill possessed only by unique Australians, despite the level of suckerness of their victims. You will be called Dame Super- Drover, defender of Murdochism, Kleinism, the American Way, and scourge of minor herds like teachers and principals. Any connection to First Dog On The Moon is intended…..with thanks.